Specifications: 3-point hitch with Cat I & II pins, 3/8" x 1 3/4" shanks with single bolt mounting, clevis rear hitch, welded construction frame and reversible chisel points. Sizes 6, 8, 10 and 12 feet. Weights: 420 to 630 pounds. Features: wedge design side frame extensions to prevent crop vines from catching frame, extensions are easy bolt-on mounting. Extensions provide versatility of a single implement to meet a growers needs when farming with numerous crop spacings. 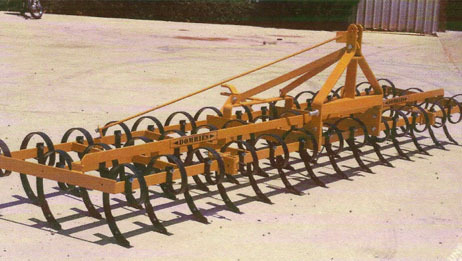 Ideal for vineyards and orchards or for general field tillage before or after primary tillage work. Reversible chisel points provide double wear life.